Rain and sleet -- with snow in the forecast -- gilded cars at Sullivan-Independence Hall on Wednesday as a Nor'easter-style storm closed in just before Thanksgiving. 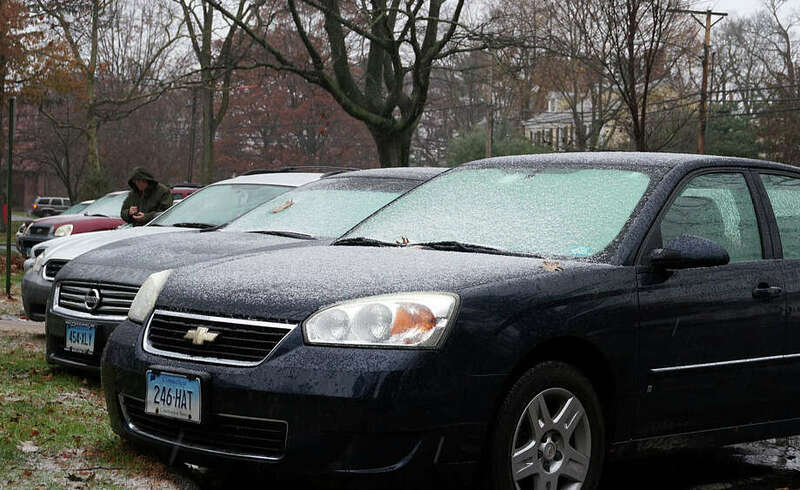 Even though weather forecasts continue to predict Fairfield and environs could have a white Thanksgiving, the Nor'easter-style storm buffeting the region Wednesday has dumped a cold rain-and-sleet mix through early afternoon. The slushy surface on roads and sidewalks, however, is making the holiday-eve rush hazardous. The storm is still expected to deposit snowfall of from 3 to 7 inches in upstate Connecticut, while the coastal regions will see accumulations of 1 to 3 inches through Thanksgiving morning. As of 6:30 p.m. Wednesday, the National Weather Service has issued a Winter Weather Advisory through 1 a.m. Thursday. As long as temperatures remain above the 32-degree freezing mark for the remainder of the afternoon, the NWS predicts the steady precipitation will be primarily rain and sleet. But as temperatures fall overnight, there will be a mix of rain, snow and sleet before 11 p.m., then mostly snow between 11 p.m. and 2 a.m. Thursday. There will be a north wind 9 to 17 mph, with gusts as high as 33 mph. On Thanksgiving morning in coastal regions, more light snow is possible followed by rain and cloudy skies throughout the day. Occasional snow flurries are possible later in the day as well, the NWS says. On Friday, however, skies are expected to clear, but temperatures will be cold, with the daytime high expected to register in the mid- to high-30s.